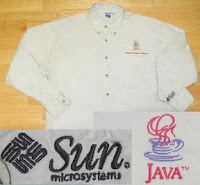 This is a SUN MICROSYSTEMS JAVA embroidered long sleeve shirt. It is a size Large in very good condition. It has the JAVA coffee cup logo embroidered on the chest and the text below reads JavaOne Developer Conference. The Sun logo is on the left sleeve. Other Java shirts are available, click the Java label below.